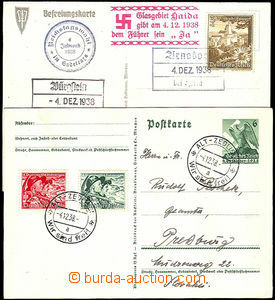 1938 occupation Sudetenland - Reg and Express letter returned back with cancel. OCCUPIED TERRITORIES, addressed to to Příbor, CDS Turčiansky Svätý Martin 9.X.38, with Pof.308 2x, on reverse return arrival postmark, incl. content, folded, rare! 1938 comp. 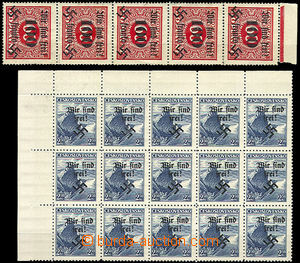 4 pcs of entires and 2 German PC with postmarks occupied post. offices, contains i.a. 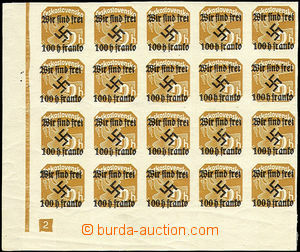 2x postal agency pmk Wiese über Jägerndorf, Heinsendorf, propagandistic cancel. Mies and Eger, censorship adt. 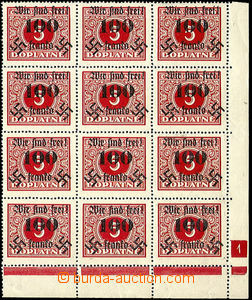 1943 saving card for Hitler-Jugend, whole also with name owner, mounted stamp. 3M A. Hitler with CDS Karlsbad 21. 9. 43. Superb condition. 1918 Polish occupation Czechosl. territory, postal agency pmk KONIAKAU with CDS Jablunkau Schles. 20.XI.18 on/for zpětném card court warrant/-s, very rare!